Ohhh friends, I’m so excited to share this sweet session with you today! 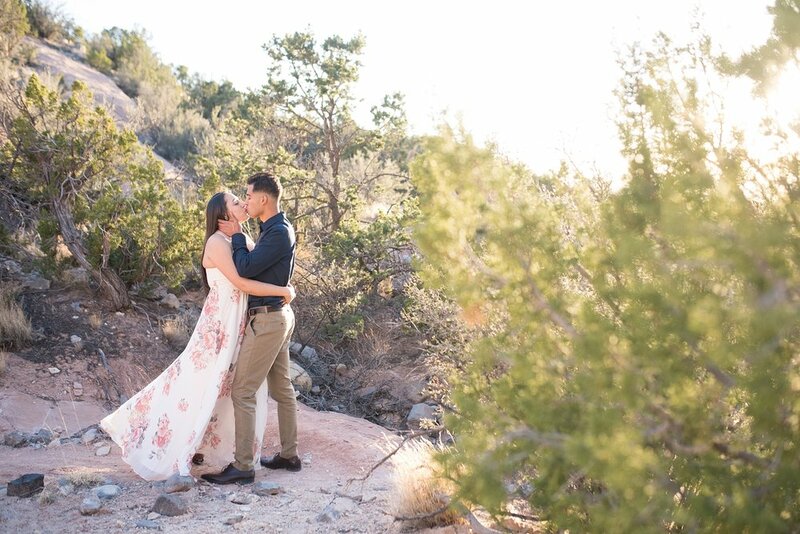 Leah and Gizeh officially kicked off “spring engagement photo” season and I loved every bit of it! Now, I’ll tell ya - the wind tried to scare us off! You see, Albuquerque weather decides it likes to do whatever it wants, whenever it wants - and that’s exactly what it did that day. But, after a quick chat, Leah and Gizeh were willing to wing it - and they rocked it! We started at Bosque Brewery and they sipped beers as they cuddled on the patio. I love that they wore their Red Sox gear - after all, Gizeh did propose at the stadium! He had Leah totally fooled, telling her that their friends had won tickets to Red Sox Field! It was a bucket list item for her, and he pulled it off flawlessly! Needless to say - she said yes! And so, the nod to their favorite team and place was absolutely perfect for their engagement session! After the brewery we took a quick drive into the mountains and adventured around as the sun went down. It was windy and chilly, but Leah and Gizeh pulled each other close and soaked in the special moment of that evening - and it.was.wonderful! I can’t wait for their wedding day this fall, and know it will be a wonderful day as well. They have family traveling from all directions, including Mexico - and its bound to be an awesome celebration!